...Je mehr ich tiber die Principien der Functionentheorie nachdenke - und ich thue dies unablassig -, urn so fester wird meine Uberzeugung, dass diese auf dem Fundamente algebraischer Wahrheiten aufgebaut werden muss (WEIERSTRASS, Glaubensbekenntnis 1875, Math. Werke II, p. 235). 1. Sheaf Theory is a general tool for handling questions which involve local solutions and global patching. "La notion de faisceau s'introduit parce qu'il s'agit de passer de donnees 'locales' a l'etude de proprietes 'globales'" [CAR], p. 622. The methods of sheaf theory are algebraic. The notion of a sheaf was first introduced in 1946 by J. LERAY in a short note Eanneau d'homologie d'une representation, C. R. Acad. Sci. 222, 1366-68. 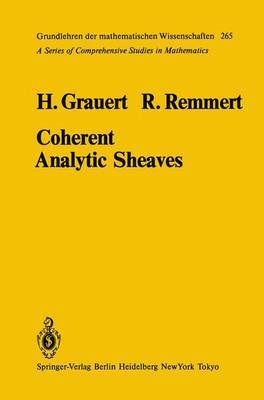 Of course sheaves had occurred implicitly much earlier in mathematics. The "Monogene analytische Functionen", which K. WEIERSTRASS glued together from "Func- tionselemente durch analytische Fortsetzung", are simply the connected components of the sheaf of germs of holomorphic functions on a RIEMANN surface*'; and the "ideaux de domaines indetermines", basic in the work of K. OKA since 1948 (cf. [OKA], p. 84, 107), are just sheaves of ideals of germs of holomorphic functions. Highly original contributions to mathematics are usually not appreciated at first. Fortunately H. CARTAN immediately realized the great importance of LERAY'S new abstract concept of a sheaf. In the polycopied notes of his Semina ire at the E. N. S.